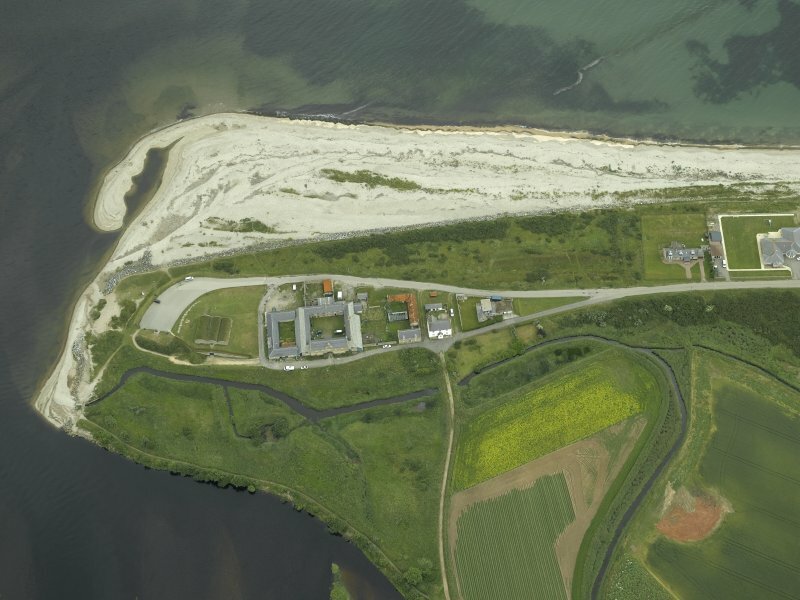 Oblique aerial view centred on the fishing station, ice-house, farmhouse and farmsteading, taken from the SSW. 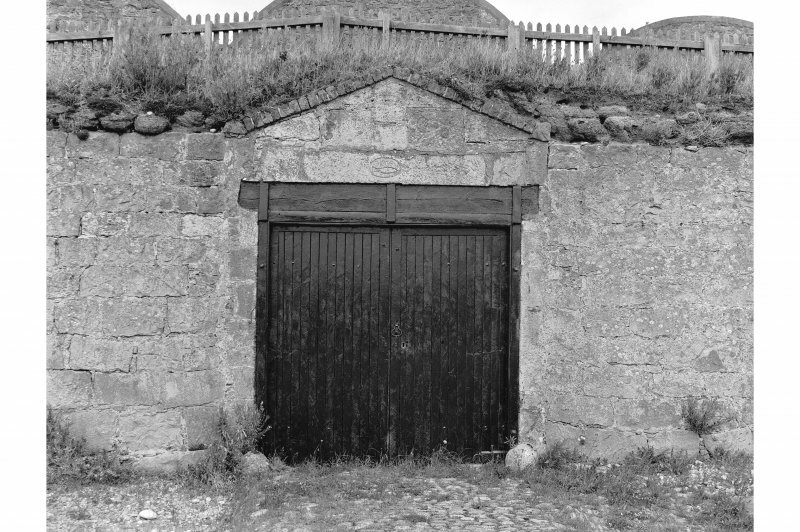 Ice house from south west. 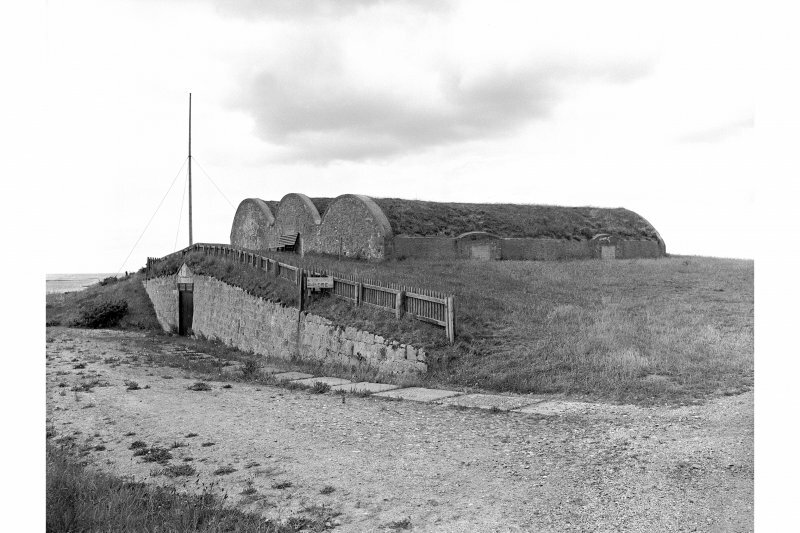 Ice house from south east. 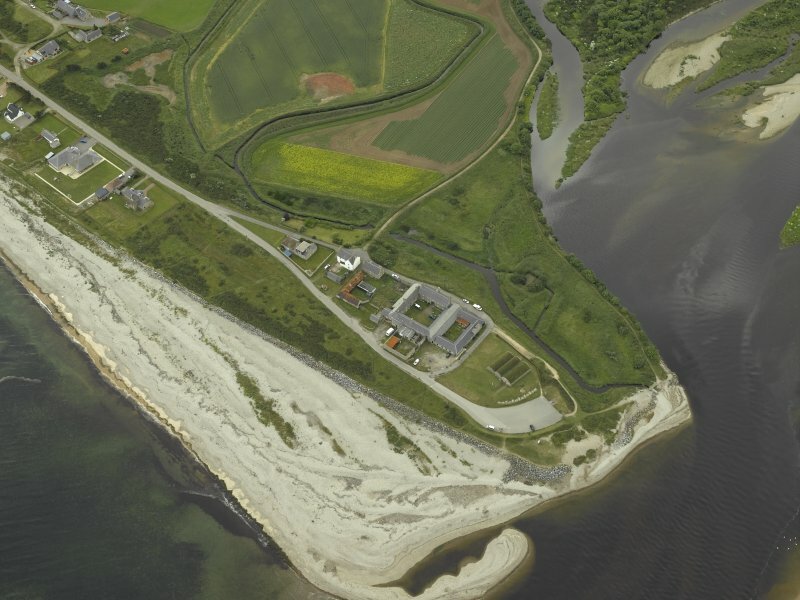 Oblique aerial view centred on the fishing station, ice-house, farmhouse and farmsteading, taken from the W.
South range, distant view from south west. 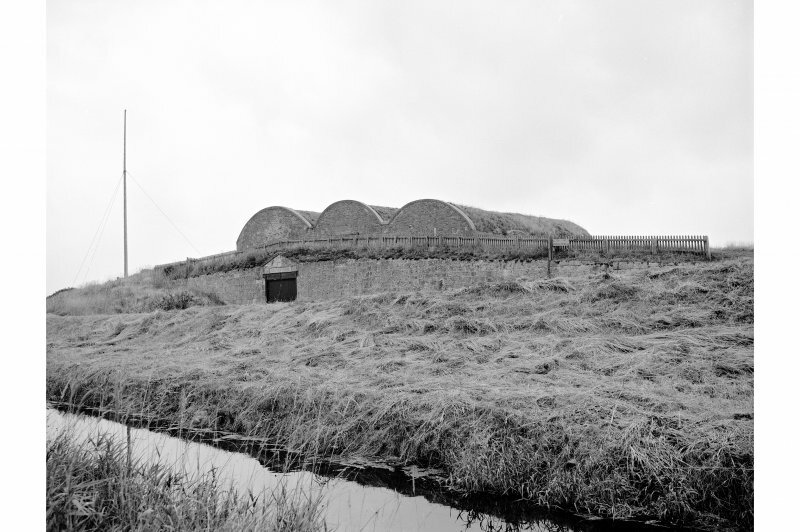 Ice house from north west. South range and pend to courtyard from south west. West range from south south west. 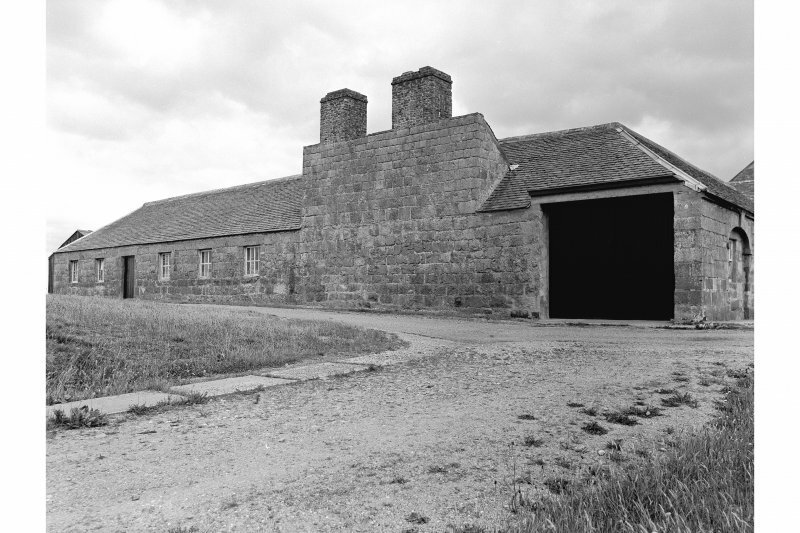 West range from south west. 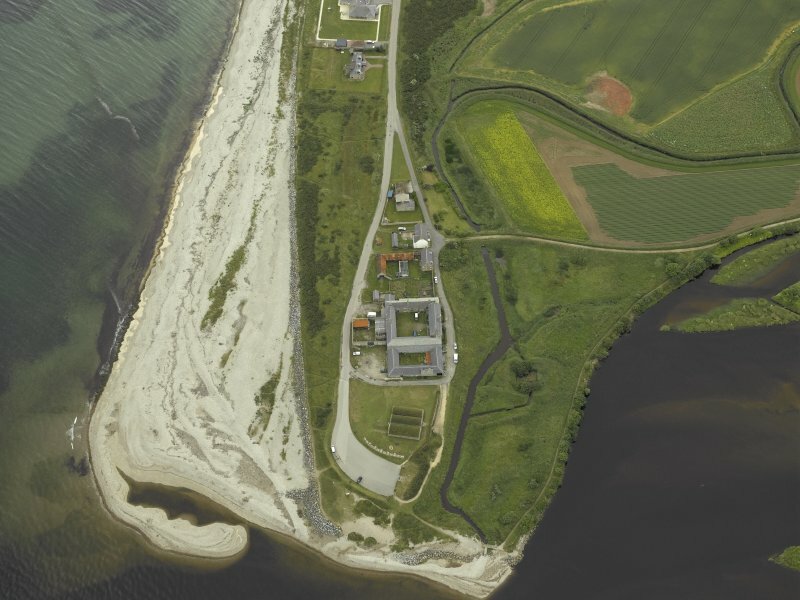 Oblique aerial view centred on the fishing station, ice-house, farmhouse and farmsteading, taken from the NNW. Location formerly entered as NJ 3491 6537. (Location cited as NJ 349 654). 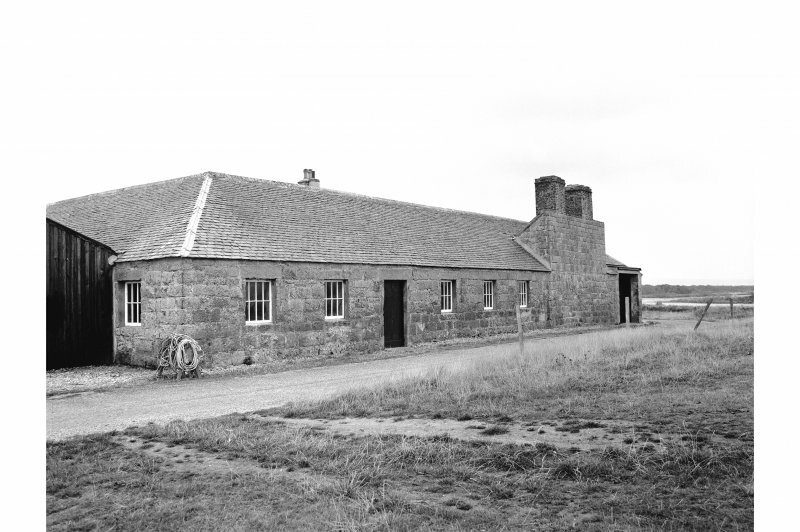 Ice-house and fishery, Tugnet, Spey Bay. Late 18th to early 19th centuries. 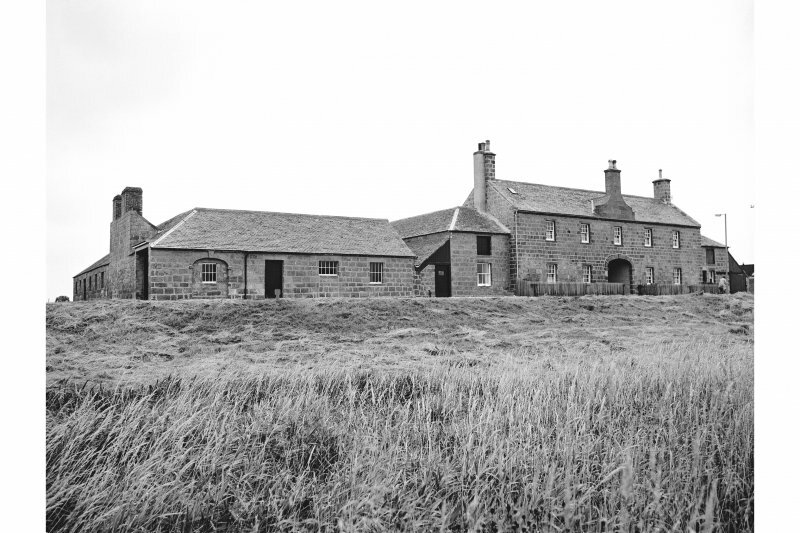 A most attractive group of buildings, including a two-storey, five-bay ashlar dwelling-house block, with central elliptical-arched pend, a rectangular one-storey ashlar store and boiling house, dated 1783, with twin brick chimney stacks for the boilers. 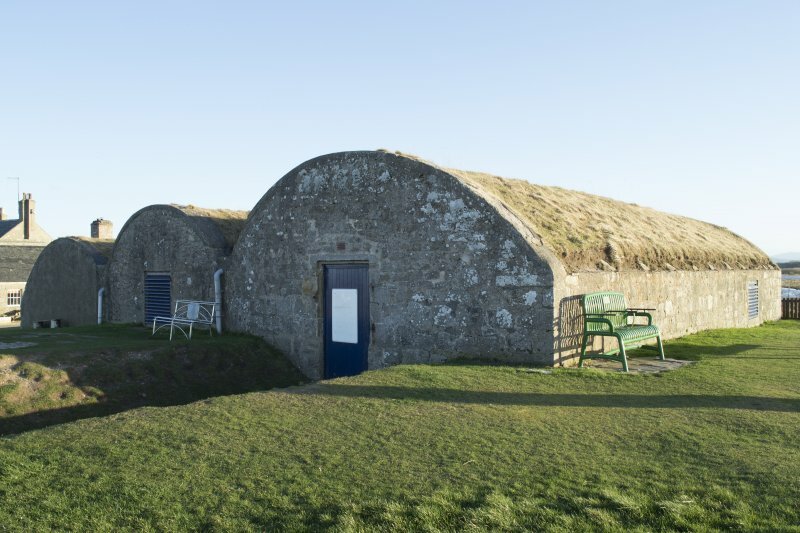 The ice-house has three vaulted bays, turf-covered. 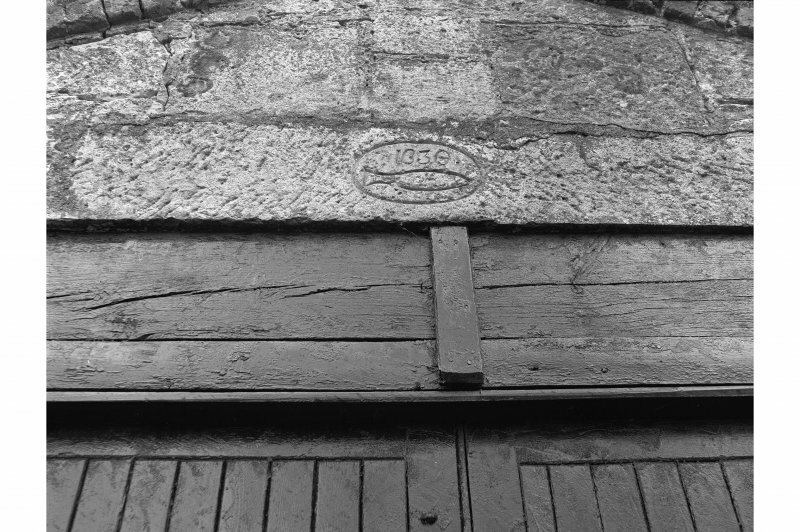 The single low-level entrance has a re-used lintel, dated 1630, with a fish motif. 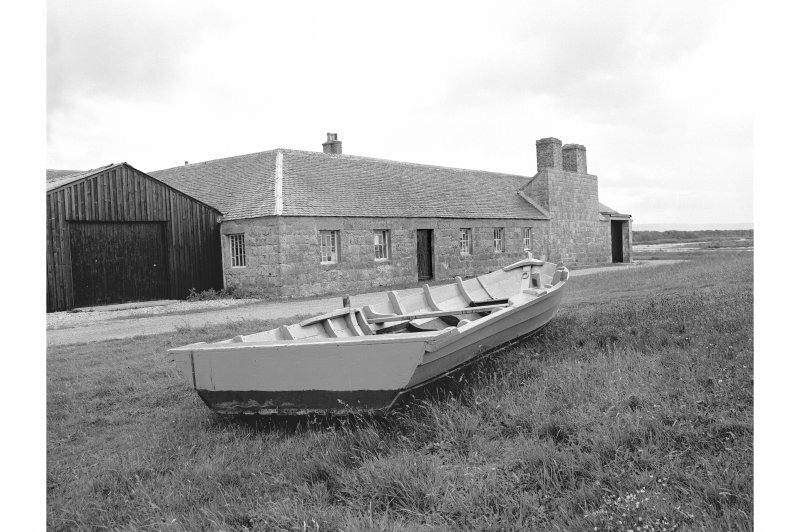 This fishing station is situated at the mouth of one of the most important salmon rivers in Scotland, and was a classic example of investment by an improving landowner in a local industry. 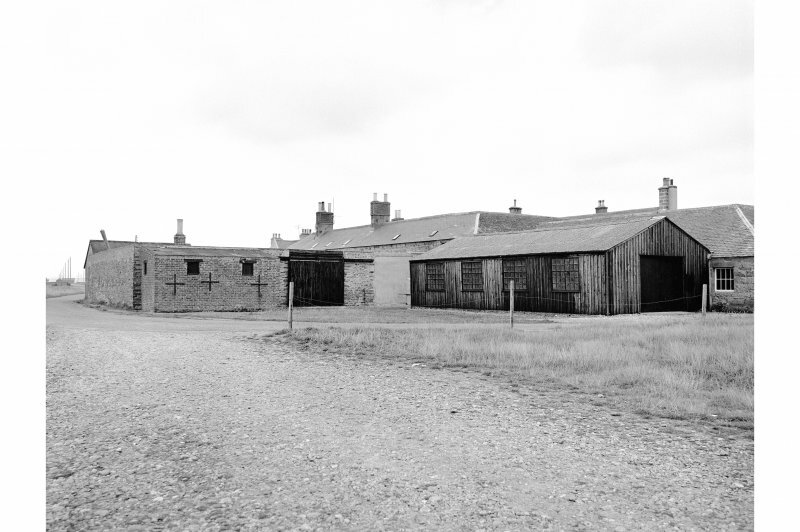 It was a large operation, employing 150 at the end of the 18th century. 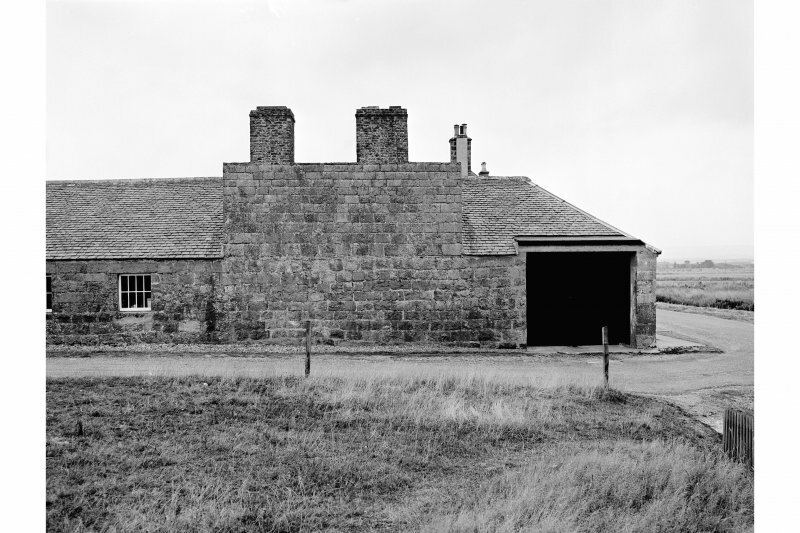 The icehouse, a substantial manager's house, a store and boiling house (1783) survive. 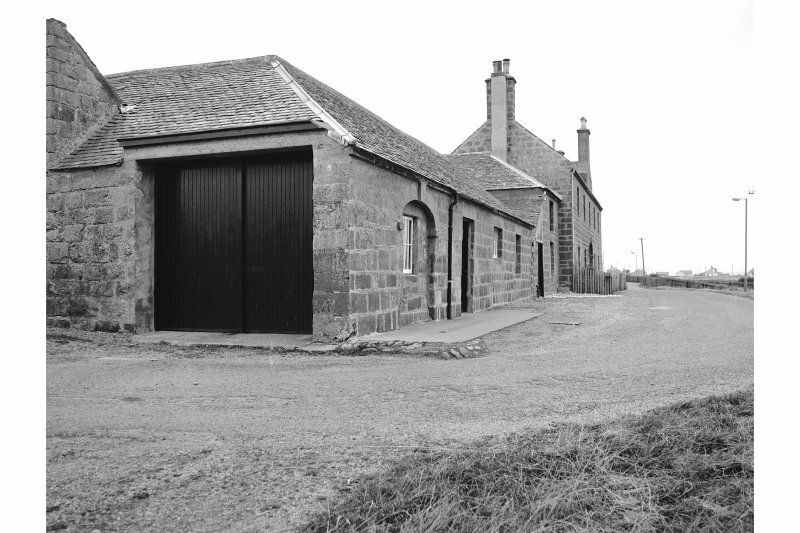 The icehouse has been restored by Moray District Council and houses displays on the salmon-fishing, on wildlife and on the local boatbuilding industry. 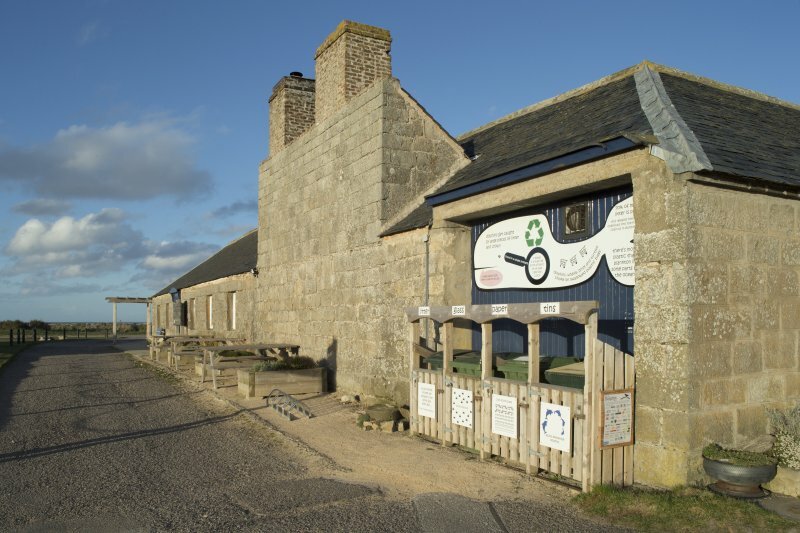 This ice house and fishery are situated on the foreshore at an altitude of 4m OD, and are open to the public at regular hours against an entry fee. 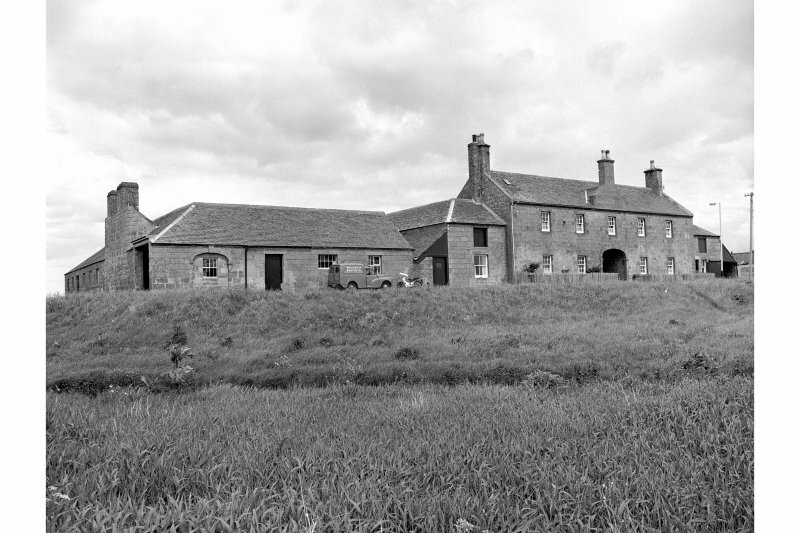 The group of buildings includes a two-storey, five-bay ashlar dweilling-house block with a central elliptical pend and a boiling-house. 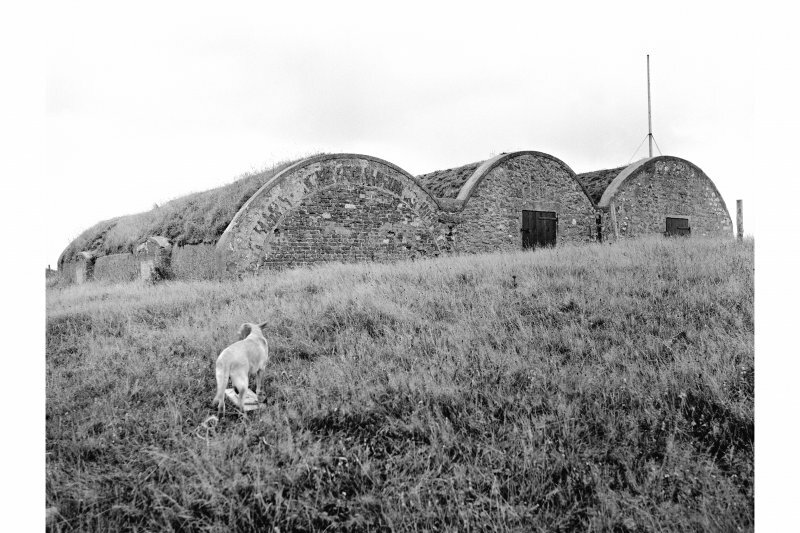 The ice house has three vaulted bays, which are turf-covered, with a single low-level entrance. 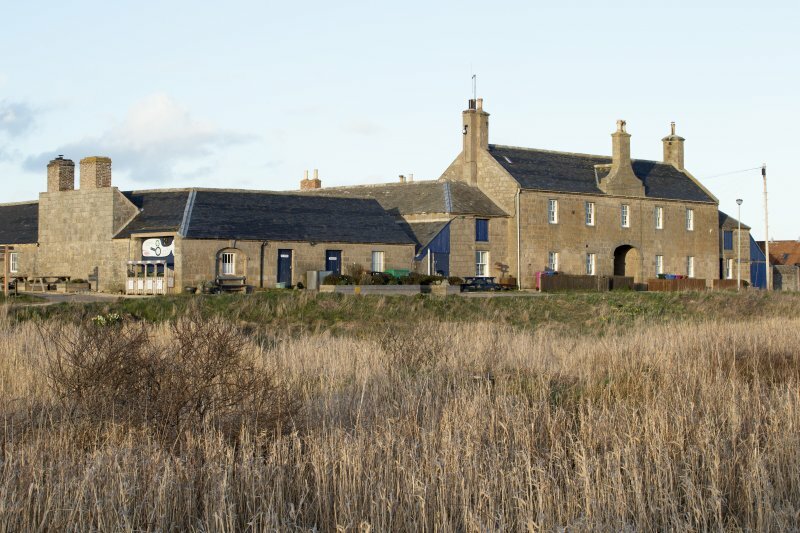 It was built in 1830 to serve the salmon fishing industry near the estuary, where netting has been carried out for centuries. 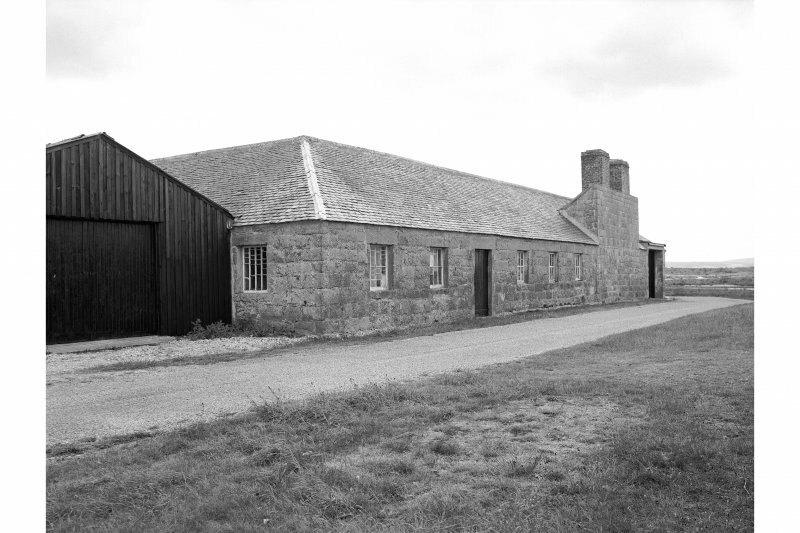 The Statistical Account describes the fishery as having buildings for overseers, coopers, etc; 150 men or more being employed at it. Ice was collected in the winter from special ponds between the salmon station and the shore. 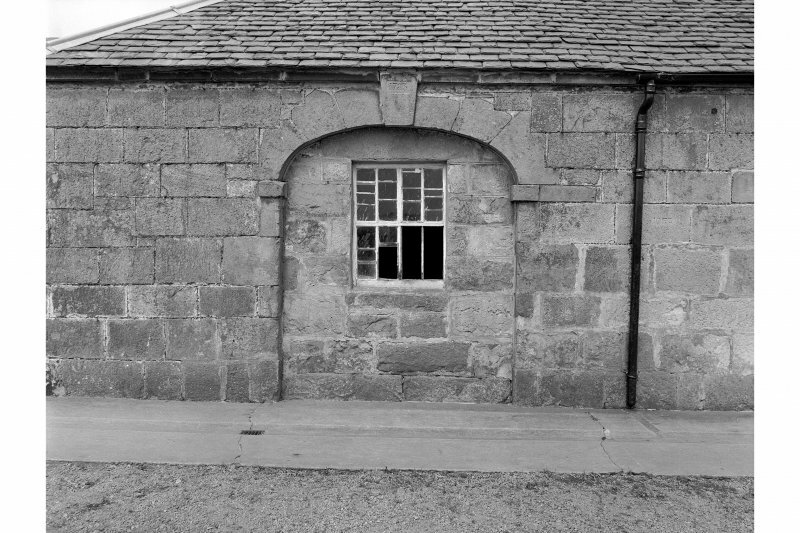 It was then broken up and carted to the ice house, where each chamber was filled up from the upper level doorways. 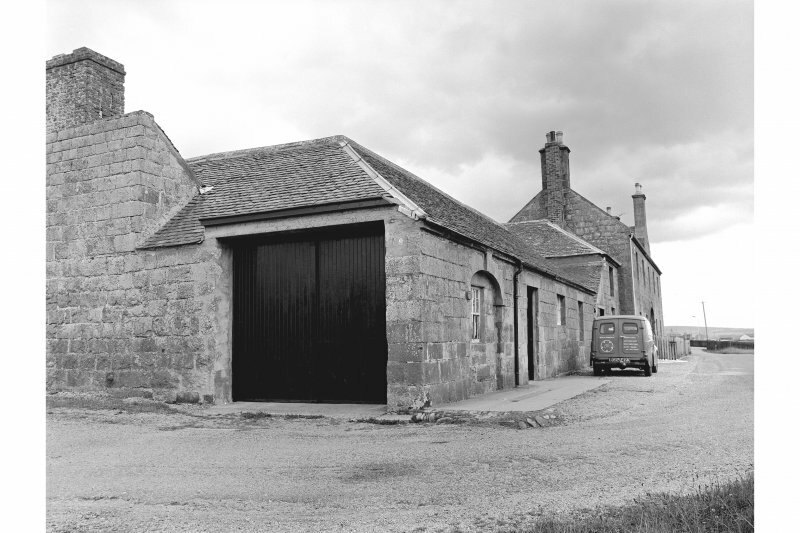 The ice house was last used in 1968, and is now a museum. (GRC photographs: GRA DH 12-15, 19 September 1984). 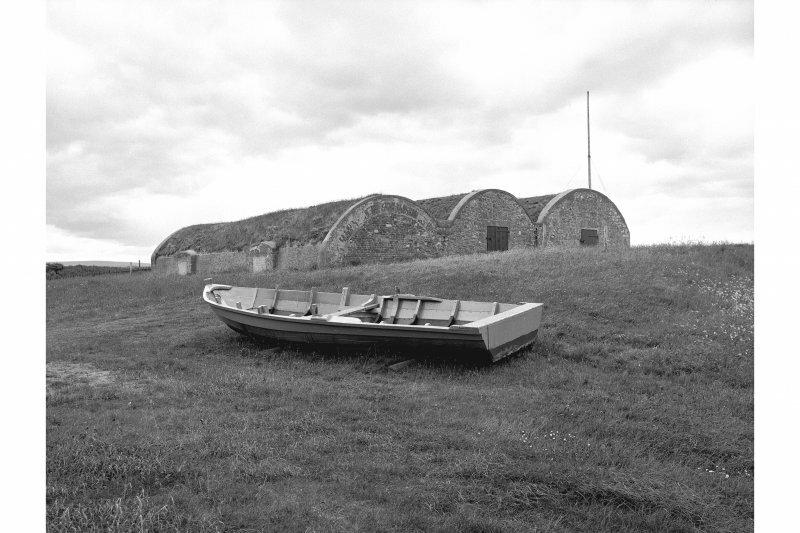 Built at the mouth of one of the most important salmon rivers in Scotland, this vast icehouse was part of a complex salmon-fIshing station which is a classic example of investment by an improving landowner in a local industry. 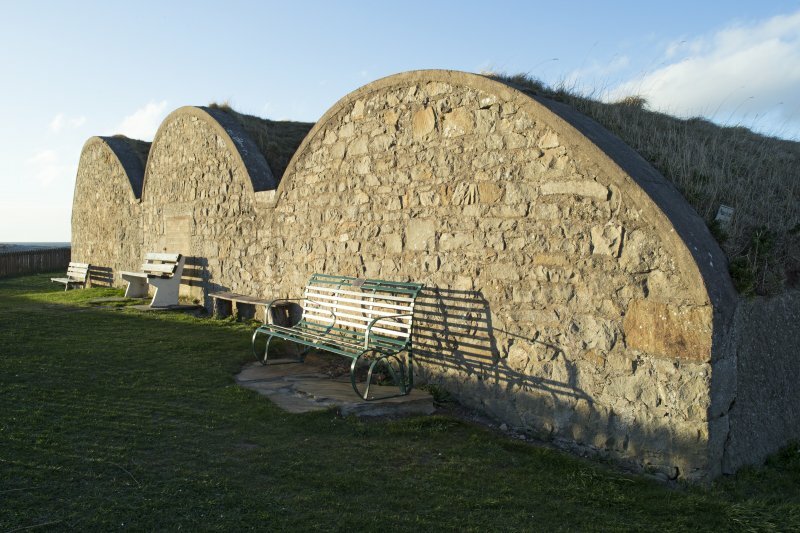 Crouched behind grey shingle ramparts are three brick-vaulted blocks that form the icehouse. 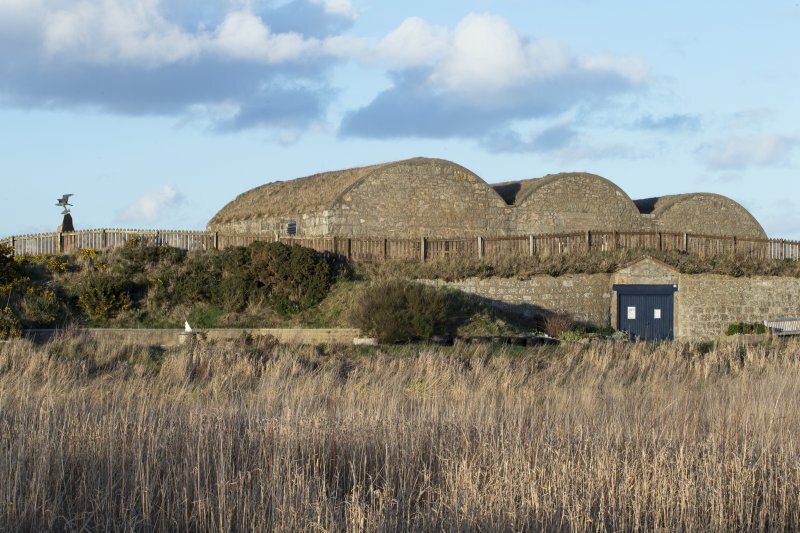 Each block contains two subterranean chambers which would have been packed with ice collected in winter from ponds near the shore, topped up with ice 'bree' from the river. The ice would have been tipped in through the doors high in the sides of the vaults; each chamber has a sump in the floor for the water melted from the vault-high ice. 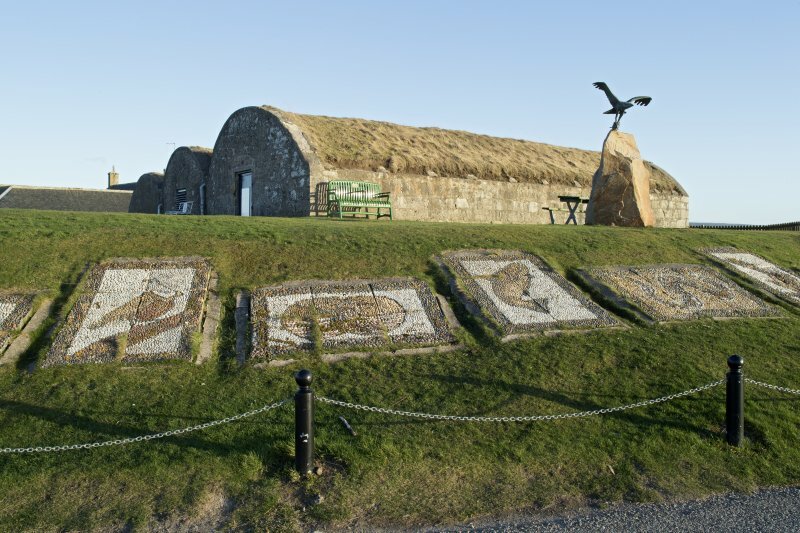 During the netting season salmon would have been stored in the icehouse, prior to being packed in ice for the journey south, initially by sea, latterly by rail. 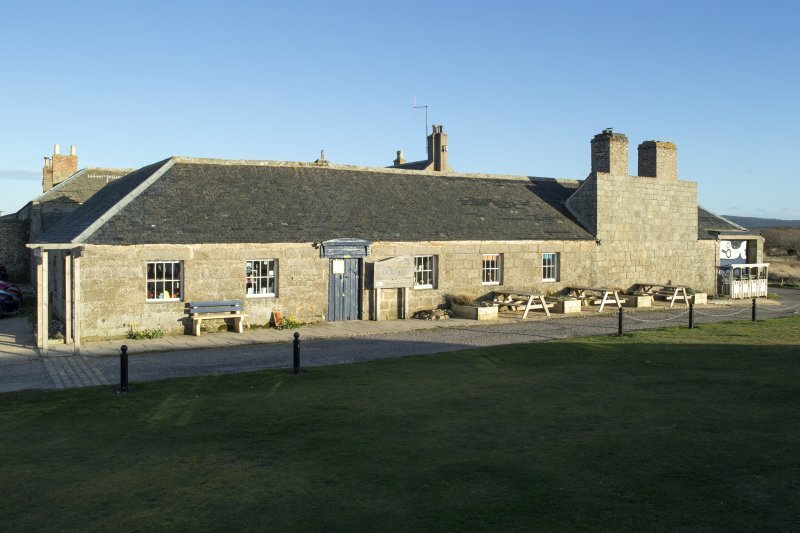 This was a large operation, employing fishers, overseers, coopers and others to a total of 150 at the end of the 18th century. 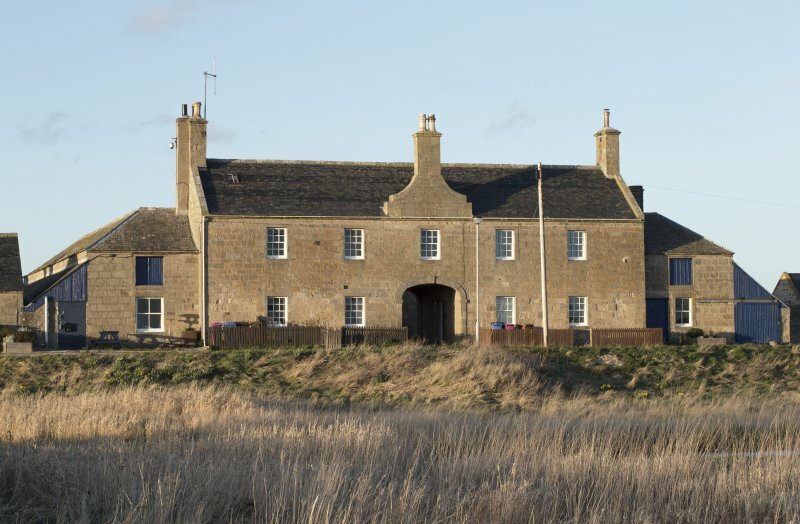 A substantial manager's house, a store and boiling house (1783) also survive.The icehouse has been restored by Moray District Council and now houses good displays on the salmon fIshing, wildlife and the former boat-building industry of Kingston, north of Garnmouth on the opposite bank, founded by men from Kingston-upon-Hull in 1784, using timber floated down the Spey from the forests of Rothiemurcus, Glenmore and Strathspey. 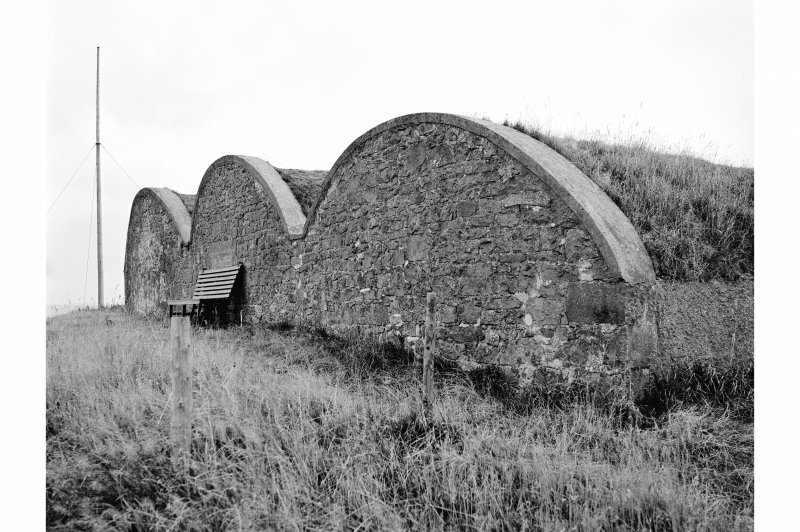 Built at the mouth of one of the most important salmon rivers in Scotland, this vast icehouse was part of a complex salmon-fishing station which is a classic example of investment by an improving landowner, the Duke of Richmond and Gordon, in a local industry. 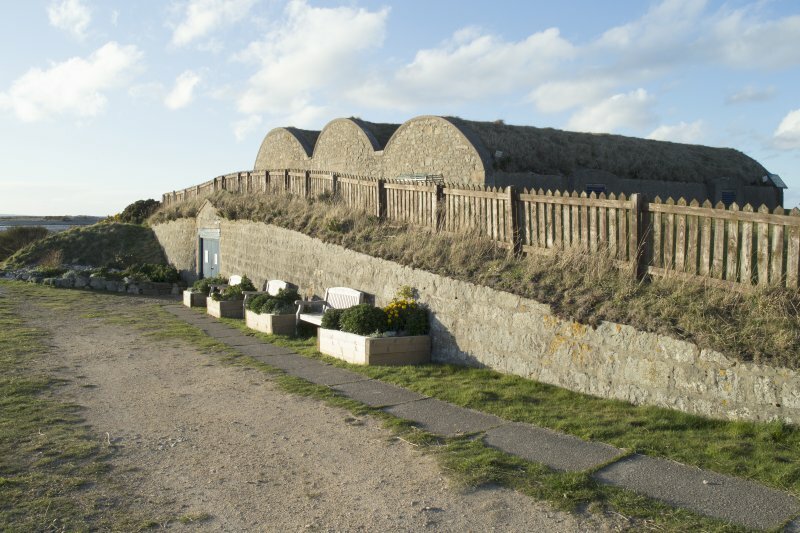 Crouched behind grey shingle ramparts are three brick-vaulted blocks that form the icehouse of 1830, which replaced an earlier version. 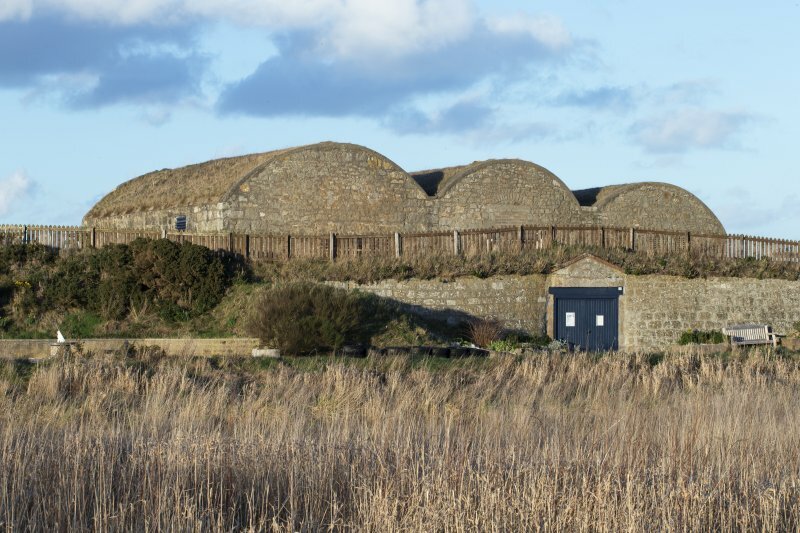 Each block contains two subterranean chambers which would have been packed with ice collected in winter from ponds near the shore, topped up with ice 'bree' from the river. The ice would have been tipped in through the doors high in the sides of the vaults; each chamber has a sump in the floor for the water melted from the vault-high ice. 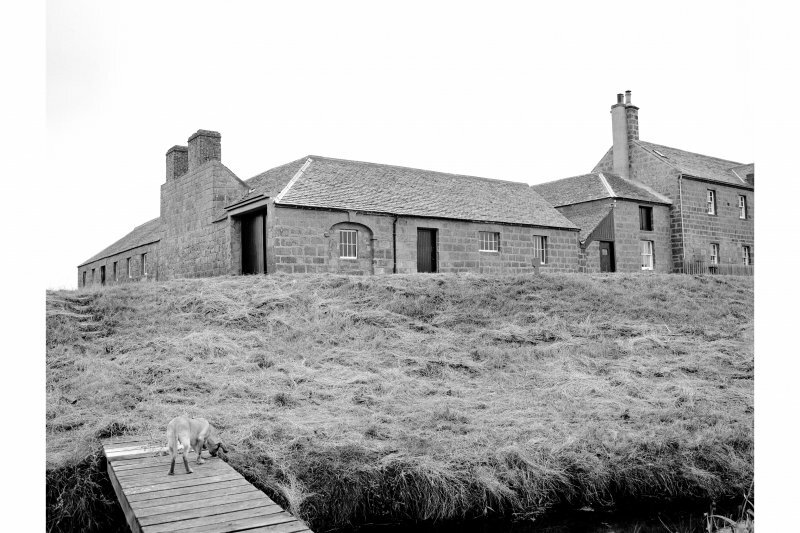 During the netting season salmon would have been stored in the icehouse, prior to being packed in ice for the journey south, initially by sea, latterly by rail. This was a large operation, employing fishers, overseers, coopers and others to a rotal of 150 at the and of the 18th century (in 1792 twenty-four ships left Speymouth, London-bound with salmon). 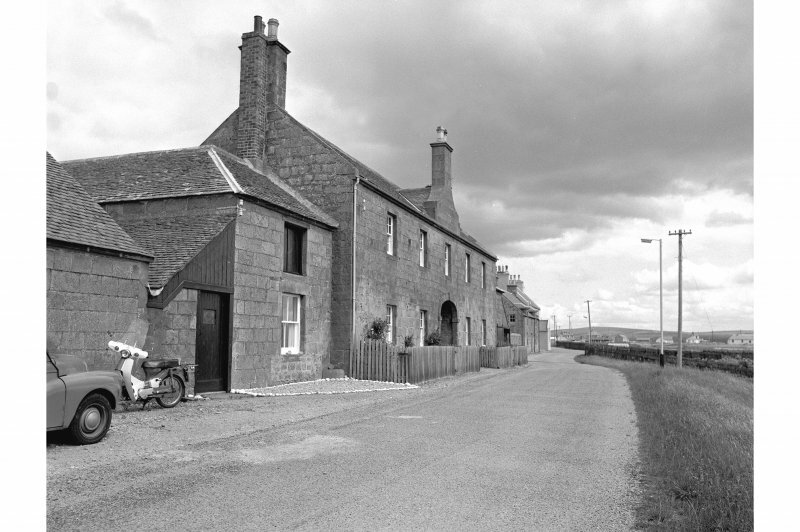 A substantial manager's house, a store and boiling house (1783) also survive. 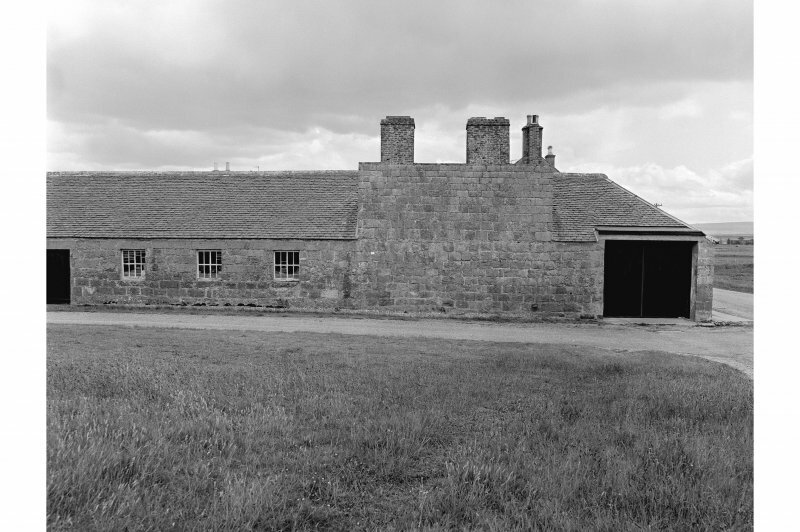 The icehouse has been restored and now houses good displays on the salmon fishing, wild life and the former boat-building industry of Kingston,north of Garmouth on the opposite bank, founded by men from Kingsron-upon-Hull in 1784, using timber floated down the Spey from the forests of Rorhiemurcus, Glenmore and Strathspey.